Congress needs to help make American energy as clean as we can, as fast as we can, without raising costs on consumers. That’s why I, along with a bipartisan group of Senators, introduced the Utilizing Significant Emissions with Innovative Technologies Act, or simply, the USE IT Act. We held a Senate hearing on this bill several weeks ago. The USE IT Act would encourage the commercial use of man-made carbon dioxide emissions and support the use of carbon capture technology, including direct air capture. The legislation also expedites permitting for carbon dioxide pipelines in order to move the carbon dioxide from where it is captured to where it is stored or used. America should reduce emissions through innovation, not punishing government regulations. The USE IT Act advances that goal. The USE IT Act is a commonsense piece of legislation to help turn carbon dioxide emissions into valuable products. We can use carbon dioxide to extract oil from wells that wouldn’t otherwise be profitable through a process called enhanced oil recovery. We can capture carbon dioxide and use it to make building materials and carbon fiber. Captured carbon can even be used for medical purposes. Support for the USE IT Act has grown from an initial bipartisan group of four Senators, when I introduced it last year, to a larger group of thirteen Senators, including seven of my colleagues on the Senate Committee on Environment and Public Works. Along with Senators Whitehouse and Capito, I am pleased this Congress to have Ranking Member Carper, Senator Cramer, Senator Duckworth, Senator Rounds, Senator Inhofe, and Senator Van Hollen as cosponsors of the USE IT Act. In addition, a bipartisan companion bill has been introduced in the House of Representatives. This Congress, I have continued to focus on ways to expedite and expand the use of carbon capture, beginning with the USE IT Act. When we work together, we have shown we can promote American leadership, grow our economy, and lower our emissions. 1) What should be the role of carbon capture and utilization technology in addressing climate change? 2) Which aspect of the USE IT Act would be most impactful in reducing carbon emissions? 3) What additional policies could support carbon capture technologies? Carbon capture (including Direct Air Capture) on a massive scale is required to reduce net emissions to zero then have 10+ gigaton of negative emissions starting around mid-century in order to have a chance of keeping warming below +2ºC. But given that even +2ºC warming will be catastrophic, we should be more ambitious and explore ways to quickly reduce atmospheric CO2 levels back to pre-industrial levels… the only levels we know are safe. Promoting the development and deployment of CCS and DAC are essential to any climate safe scenario. But while CO2 utilization is a great initial application for CCS and DAC, such applications cannot scale to the levels needed, so direct incentives for sequestration are also required. The best approach is the Fee and Dividend/Carbon Dividends Plan policy of putting a rising price on the CO2 content of fossil fuels and then giving 100% of the funds collected back to every legal resident on an equal basis. Studies show this will create 2.8 million jobs and grow GDP by $1.4 trillion, while cutting emissions by more than half. This policy is supported by grassroots organizations, leading Republicans, and companies such as Shell and ExxonMobil. If a credit is given for certified sequestration, it will drive the deployment of DAC at a massive scale. Note that CCS should not be used to continue the use of coal power plants. They are already not cost-effective compared to renewables and adding CCS will just make them less cost-effective. In addition, the health impacts of coal power exceeds the value of the electricity produced so coal power has negative social value… even before accounting for the climate impacts! It’s hard for me to imagine any use of captured CO2 that would be large enough to matter. There are certainly viable uses, and more might be developed, but they are tiny niches. One could as well claim that drinking water is a way to address the problem of spring floods. The largest potential use of CO2 would currently be for enhanced oil recovery from mature oil fields. It’s an order of magnitude larger than any other use, but even that market could absorb only a tenth of the CO2 that we generate. Sequestration / storage is the only realistic option, as far as I can see. BTW, I agree with most of what Dan Miller wrote in his response, but not about CCS for coal. There are ways to burn coal that have zero emissions, so long as one is sequestering the CO2 stream. I’m thinking of oxy-fuel combustion and chemical looping combustion. They’re not being developed, because development is costly and there’s no incentive. For one thing, we haven’t made an inch of progress in deploying the sequestration infrastructure that would have to be in place for zero-emission coal technologies to make sense. It’s a valid observation that bolting on post-combustion carbon capture from flue gases onto existing power plants is costly and impractical. We’ve leapt from there to the conclusion that CCS in general is impractical. We ignore the fact that a major part of overall CO2 emissions derive from processes that either already produce pure CO2 waste streams, or could be modified to do so at very low cost. Those processes include production of aluminum, portland cement, ethanol, and hydrogen. Those account for about a quarter of anthropogenic carbon emissions. For those processes, capture of CO2 is not an issue. It’s right there, at the point of production. But it needs to be piped somewhere for sequestration in a depleted oil field or in a deep saline aquifer. Opponents will claim that geological sequestration is too risky, that it hasn’t been adequately researched. They’re blowing smoke. The research is solid. Injected CO2 will never escape from well chosen sites. It will be mineralized. The sites do have to be selected with care, but surveys have found no shortage of them. And CO2 pipelines do have to be built with safety measures to prevent ruptures from flooding low lying areas with suffocating CO2. But the risks are minor in comparison to others we’re happy to live with. Roger: It’s true that the level of sequestration needed is an order of magnitude more than CO2 reuse applications. However, some applications are not insignificant. Cement/concrete from CO2 could be several to 10 gigatons per year (10 GT of concrete is currently used each year) and carbon fiber from CO2 to replace steel could also be several gigatons. New high-value but relatively low-volume applications could also be important to drive the development and deployment of early carbon capture systems and prepare for the day when the world decides to actually address the climate crisis by scaling up CCS and DAC. EOR is currently the largest market for CO2 and that’s important because it is currently the only reason to develop and deploy carbon capture systems. There are no other material incentives to build carbon capture systems even though they are required to save civilization. This is not a fault of EOR, it is a fault of policymakers who have not put proper incentives in place to address the existential problem before us. Senator Barrasso should be commended for this sensible, bipartisan proposal. Carbon capture, utilization, and storage continues to need government support to become commercial, and most practical people realize that for energy security, as well as environmental reasons, we need to have more options available to broaden the energy mix. Enhanced oil recovery is already a very well established practice and useful to the energy industry, and is a good place from which to further develop R&D and deployment of this technology. I was wondering if there might be an alternative way to proceed. In order to have a low carbon future we will need to create a low carbon continuum. Today about 80% of the carbon dioxide that is released into the atmosphere comes from the end use sectors of transportation, residential, commercial, industrial, and agriculture. So even if all sources of electricity were carbon-free by using renewable energy and nuclear power, we would still be far from achieving a low carbon future. [ This simple fact shows how limited some political mandates are in dealing with climate change by pushing for 100% renewable electricity by some future date… useful, but very limited]. By far the greatest low carbon future challenge we face lies in getting the carbon out of the end use sectors. This entails more than electric vehicles, it also entails hundreds of millions of fossil fueled space heaters and hot water heaters, etc. This means going house-to-house, store -to store, etc., changing out present fossil fueled appliances, a task much larger than building wind farms or new molten salt nuclear reactors. In many cases, like electrified transportation, these present fossil fueled end use appliances will have to be replaced by an electrified version that accomplishes the same function, like space heating. This means far more electricity will need to be generated. Plenty of room for both renewable electricity and nuclear power. What about coal? Perhaps the deal the coal industry has to consider is to create a massive trade-off. Could the coal industry subsidize carbon-free (electrified) end uses, like EVs, electric space heating and electric hot water heaters,etc. and get carbon credits for doing this? These carbon credits would then be used to offset the CO2 the coal plants release so that the whole process is carbon neutral. This would move us closer to a low carbon future because we must eventually have all carbon-free end use devices and simultaneously we need to maintain the reliability of an electricity supply system that will have to be much larger than we have today. This scheme might help assure sufficient electric system reliability in a time of great expansion, but without adding to our GHG releases (GHG neutral). Creating a carbon neutral trade-off structure is an intermediate possibility since it does not reduce our overall GHG releases. 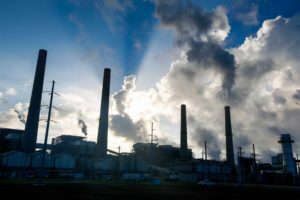 However, it would buy time for the coal industry to make other technological advances that would result in reductions in the GHG that coal releases to the atmosphere today. In summary, it is suggested that Senator Barrasso explore maintaining the coal industry by establishing a CO2 neutral trade-off structure by first subsidizing the replacement of fossil fuel burning end uses while examining the feasibility and costs of CO2 release reduction processes. America needs a lot of energy produced if we are going to be able to continue living the lifestyles we are accustomed to. America also needs to use it’s energy sources wisely. Coal needs to be used to produce America’s electricity as we have over 600 years of high quality coal available. With Carbon Capture Utilization https://youtu.be/RQRQ7S92_lo coal can be combusted and put into the atmosphere less CO2 than a natural gas power plant. It cost money to install our Sidel Carbon Capture Utilization System, but we have in our plans reimbursement to the utility for those costs through the sale of the produced three by products. But Wait. There is more. We got started to develop our Carbon Capture System in 2010 when we realized what the Administration at that time was doing to the coal industry and all these families and these communities. Naturally when we brought it to the DOE Clean Coal Division it did not go very far. That did not fit in the Presidents plans for the industry. We are right now trying very hard to get it in front of the right people in the Trump Administration. Even that has been a challenge so far. While we have been waiting, we have not stopped developing. A natural gas power plant is approximately 14% more efficient than a coal power plant and there is still “stuff” in the coal exhaust. We came up with “Waste is not waste if it has a purpose”. During the past years we have developed equipment that consumes a lot less energy and requires a lot less maintenance than methods being used today. The coal can be combusted better. The boiler tubes can be cleaned without using steam. The ash can be removed much more efficiently and with much less maintenance. Coal ash has a number of purposes, but it has to be cleaned. The particulates that are recovered have value. There is heat energy in the cleaned coal exhaust that also has value, that can be used to create even more full time jobs. When the heat energy is removed from the exhaust, water is being created and this water can be used by the power plant, conserving well lake or river sources. Americas natural gas should be used for residential and commercial building space heating and by industry to produce all those products we consume every day. Large commercial and industry can also consume their natural gas more efficiently. http://www.SidelSystems.com For every 1 million Btu’s of heat energy that is recovered from combusted natural gas exhaust and is utilized, 117 lbs of CO2 will not be put into the atmosphere. In every 1 million Btu’s of combusted natural gas are 5 gallons of recoverable distilled water. Natural gas and LNG can also be used as vehicle fuels. Americas oil should be used as transportation fuels and sold providing America with income. Our transportation producers have been doing an incredible job increasing the efficiency of moving these units around the country. We believe by applying the above measures starting with the plants growing in the fields absorbing CO2 then being turned into a sorbent to absorb the CO2 out of the combusted coal exhaust, and the large volumes of calcium carbonate then be used to create sea walls to build protection to our shore lines, can only be good for America, by making the most of what we have, to provide America all the energy we need for many generations. My comments respond to the question of: “What should be the role of carbon capture and utilization technology in addressing climate change?” Currently a logical justification for a role for carbon capture and utilization technology does not exist. This justification does not exist due to mistakes that have been made in the design and construction of the United Nations IPCC’s climate models. The existence of these mistakes can be proved. A consequence from the existence of these mistakes is for a climate model to provide a policy maker with no information about the outcomes of the events of the future for Earth’s climate system. To try to regulate this system under these circumstances is like trying to fly blind. Thank you for all your work on the Environment and Public Works Committee. I went back and read your op-ed piece in the NYT “Cut Carbon Through Innovation, Not regulation” (12/18/2018). In it you were succinct in pointing out that raising the cost of energy is not the answer to lowering emissions. Carbon capture and its transport for enhanced oil exploration (EOP) benefits oil and gas industry the most. It puts a huge onus on Power Generation to install this costly equipment. How will they be compensated for that? What percentage of the CO2 emissions that are captured will be utilized for EOP? How will the pipeline structure that transports the CO2 to the gas and oil fields be funded, will it be a P3 structure, government funded or will it end up being charged back to the rate payers? There is already significant opposition to any pipeline structure. States are being proactive and requiring environmental impact studies, how will the FAST Act address this? It is well documented that CO2 is a heat trapping gas which is linked to increase in global temperatures. And all of the current focus is on reducing CO2 emissions or capturing these emissions for beneficial use. However what is missing from the discussion is the curtailment of the heating of the air being put out into the atmosphere from industrial processes, data centers, transportation sector, and commercial and residential units. For example, if you use a 1500W hairdryer for 1 minute that will give off a bit of heat but it also generates a small amount of CO2 in the power plant that powered the hairdryer. If you take all the warming over time that is caused by that small amount of CO2 and compress into 1 minute, the heat generated would be equivalent to two 747 aircraft at full take-off power! Put another way, the current energy imbalance caused by excess greenhouse gases trapping more heat than the Earth radiates into space, is equivalent to about 500,000 Hiroshima-size atomic bombs going off every day! The bottom line is that waste heat is not the issue. The issue is greenhouse gases. I am referring to exhaust air coming out of the stacks, tailpipes, etc. Similar concept to intake cooling water where water discharge temperature is regulated. Yes, that is what I am referring to as well… heating of the atmosphere by manmade industrial processes. Perhaps the least cost, least restrictive way to meet climate goals, an approach once championed by Republicans and even some in the fossil fuel industry is a Cap and Trade approach. This brings market forces to bear directly on the central issue: the need to reduce carbon emissions. It has been employed successfully in several regions, both in the US and abroad. The two specific areas where the USE IT Act might be counterproductive are: 1) Capturing and sequestering carbon emissions is not the least cost means of reducing emissions (far cheaper to prevent the emissions in the first place; and 2) Creating a market for CO2 effectively presents an additional financial incentive for creating it in the first place. Both emission Cap and Trade and Carbon Tax approaches can be made revenue neutral by returning funds back to tax payers and/or energy users. I think either is a better approach than USE IT. I am in concurrence with Dan and others that current market forces cannot support the large additional cost attendant to wedding CCS with current energy/industrial based systems, much less the MUCH higher cost of Direct Air Capture. The support provided under the proposed piece of legislation doesn’t change that calculus much either. What is necessary is to: a. Establish a realistic price on carbon that captures externalities in a honest and comprehensive fashion; this needs to include the impacts of our emissions globally, not simply in the US, if we’re going to meet our obligations under the Paris Agreement in an equitable fashion; b. Implement a cap and dividend plan of the kind that Dan outlines above that scales up to conform roughly with the price of carbon. Only then will we provide the kind of meaningful incentives that will spur commercial enterprises to embrace CCS or Direct Air Capture. In terms of Direct Air Capture, we also need much more funding of basic R&D to help us reduce costs and make it a potentially viable technology from a market perspective. Direct Air Capture may be critical in helping us address emissions from sectors that are particularly difficult to de-carbonize, and where CCS is not that pertinent, including the transportation sector and cement. In the longer term, we should consider proposals e.g. Klaus Lackner at Arizona State, to treat carbon emissions as “waste,” imposing a fee for “collection” that would help to drive penetration of Direct Air Capture into the market. Will: To clarify one point, I propose a Fee and Dividend (F&D) policy, not a Cap and Dividend (C&D) policy. With a cap, the carbon price is set at auction while the fee is set a priori and constantly rises. There will be far more investment, development, and deployment of clean energy technologies under F&D because, simply, the future carbon price is known in advance. With a cap (like with Cap and Trade), the carbon price can vary wildly and drops precipitously during a recession. This issue is one of the main reasons that Cap and Trade policies have not been effective in significantly lowering emissions. The Dividend part is also important because by giving all the money back to the public they will support a high carbon price that will actually make a difference! Having worked on carbon capture projects (and their twin, coal gasification), my experience has been that these projects fail miserably. The economics are just not there and the additional infrastructure expenditures required do not justify the capital expenditures. Think about it….what are you going to do with all that CO2? There are only very limited and situational applications for such a process. Unless you are right on top of a fracking operation, there is absolutely no point. Building interstate pipelines for Co2 is just plain silly. You are transporting a commodity which has barely any value — if any value. You want to make a difference here? Plant trees….lot’s of them. THEY have value. Bill: There is no market for sequestering CO2 because we value the damage it does to society at zero. If we put a significant price on carbon, there will be incentives to stop using fossil fuels and capturing and sequestering CO2 when the use of fossil fuels still makes sense. And while it’s great to plants trees, they do not remove the CO2 from the biosphere. As climate change accelerates, the trees will die from fire, flood, drought, infestation, temperatures shifts, etc. and will release their CO2 back into the atmosphere at the worst possible time. There are many benefits to planting trees and it should be pursued, but we should not count on it for reducing atmospheric CO2 over the long term. To echo the comments of others, this seems to be a cludgy approach carbon management. Putting an actual price on carbon would help create economic incentives for carbon capture and utilization (while not favoring that approach to carbon management over others, such as nuclear/renewables/storage). In the meantime, continued R&D funding on CCS and direct air capture should continue to be pursued. I’d prefer the USEIT act over doing nothing, but not over a sensible carbon price. I agree on the need to incentivize use of captured carbon, both from direct air and from industrial processes. IMO the best way to do this would be through a Two-way Carbon Tax, under which emissions of carbon were penalized at a fixed rate (e.g. $25 per ton) and capture of carbon was reimbursed at the same rate. Such a tax would reward all kinds of capture regardless of technology. Of course, people who captured the CO2 would have to figure out what to do with it, since they would have to pay the emission tax if it were allowed to escape back into the air. All storage technologies would be equally incentivized. Meanwhile, the USE IT act might be a partial, second-best approach, although I have not seen the exact incentives it proposes. Ed: I agree in general, but $25/ton is too low. The tax/credit should start at $10/ton and grow $10/ton every year. This will ensure the orderly phase out of emissions which is required for survival. And give all the money (net of the credits) back to the public so that they support the rising fee. The bipartisan USE IT Act is a strong and necessary step in enabling market-driven carbon capture and realizing its benefits for American consumers, while also addressing climate change. The scope of support on and off Capitol Hill for it is unusually broad, especially for a climate/clean energy proposal. It’s a great example of a politically and technologically pragmatic step toward both addressing climate change/expanding clean and reliable power and allowing the U.S. to lead the world in a technology that will be increasingly needed as China, India and other developing nations particularly step up their fossil fuel generation. Bravo to Sen. Barrasso and others who are leading the effort. Word from the Hill is that some members of the GOP are coming to a level of acceptance of Climate Change as a largely man-made phenomenon. I like Mitt Romney’s comment that we would be in worse trouble if that wasn’t true. However, many Climate Change converts are talking about a supposed need for new technology, much of it required to keep the fossil industries in charge of providing our energy well into the future. The comments seem like closing the barn door after the horses have already gone. As a resident of a coal state and neighbor of another primary coal state, WVA, like the Senator, I have watched the demise of the coal industry and seen the devastation it has caused. Certainly, we will need technology improvements for an energy transition and many will occur as the renewable industries secure a larger share of the market. But what recent analysis is showing is that the process of change has reached the point of peak demand for the old technology, a point that is followed by rapid change and from which there is no turning back. “The spectacular fall in prices and the increase in flexibility provided by digitization has driven very rapid growth for the key industries of solar PV, wind, batteries and Electric Vehicles.” (2020 Vision: Why you should see peak fossil fuels coming). This paper sees “three main aspects of the energy transition: energy efficiency moderates demand growth; the decarbonization of the electricity sector: and the electrification of the energy end use sectors,” as Hershel mentions. We have seen flat demand for several years now in the US, and we are now seeing the turn to electrification in many places. To illustrate the transition analysis point … Global demand for coal peaked in 2014, earlier in Europe where the electricity sector has had to write down $160 billion in assets over a seven-year period to 2017. Noone really saw it coming. This view of technology change says the innovation phase … up to 2% penetration of the new technology … turns into the peaking phase when the old technology starts its inevitable downward slide. The Peaking phase only lasts long enough for penetration to reach 5-10%, after which rapid change takes over and the write-downs occur. Many, not just the authors of this paper, believe that coal has already peaked and the rapid transition phase is occurring. The numbers of closed and scheduled for close coal plants affirm this. “America has officially entered the “coal cost crossover” – where existing coal is increasingly more expensive than cleaner alternatives. Today, local wind and solar could replace approximately 74 percent of the U.S. coal fleet at an immediate savings to customers. By 2025, this number grows to 86 percent of the coal fleet.” (https://energyinnovation.org/publication/the-coal-cost-crossover) Companies who do not see this are at risk, and evidently the only thing keeping some of these coal plants from fully closing is their regional capacity payments. Let’s put our money and policy into making, not holding back the transition. It will cost customers less, the government less, although assistance for communities centered in old technology will be helpful to the citizens there, and let’s move toward reducing the effects of climate change while we still can. Congratulations on your USE IT act to develop practical uses of CO2 emissions. I believe the most important aspect of the act is stimulation and support of new uses of carbon in CO2 which is exactly what we need, and what I am trying to do with advanced systems and methods for economically growing microalgae for conversion to algal oil in my Algae Energy Farm concept. Carbon makes the world go-around, and our mobility and essential heavy-vehicle transport (HVT) energies will not be supplied by crude oil indefinitely, or by battery power alone, but will be needed during a potentially long transitional period to advanced fuels such as hydrogen fuel cells. Zero or low-cost waste CO2 (as well as certain nutrients) are essential for renewable algal oil to become a realistic substitute for declining conventional, and unreliable unconventional, supplies of crude oil. Frackable oil production is fantastic but is draining cash flow sources beyond prudent limits which could lead to dire results. Renewable microalgae biomass grown with waste CO2 can also provide high-protein animal and fish feeds and bio-fertilizers to help feed an almost 50% increase in world population by the end of this century. The over-hyped algae industry is not dead but is regrouping into a practical approach based on high-value products first, followed by high-volume products later. In my plan, a 200-ha farm producing 12,500 mt of biomass per year will need twice that, or 25,000 mt of CO2 at low cost. In order to produce a reasonable supply of algal oil, ethanol fuels, protein feeds, etc., we will need over a million ha of non-arable land which is possible. If successful, our total CO2 requirements will eventually be the same order of magnitude or larger than the total US EOR uses of CO2. The role I see for carbon capture and use to mitigate climate change is as big and as soon as possible to get the job done. Direct reduction of CO2 in-air will become increasingly important to begin reducing existing CO2 concentrations as soon as possible. This is a complex and challenging science and I am not a direct reduction expert. However, several processes being developed appear straight-forward and rely on resins or solvents to capture low levels of CO2 as large volumes of ambient air flows through some type of embedded matrix or substrate which is later activated by water to release the captured and dissolved CO2. Very large covered algae ponds spread over very large land areas seem ideal to provide low cost surface areas for substrate needed for the resins, the energy and air-flow needed for filtration, and even one immediate end-use for the captured CO2 (the pond water and algae), while providing reductions or cost sharing of energy and expenditures. – Including the price of GHG effects in the pricing of renewable and non-renewable fuels. – Committing serious money to focused renewable fuel research and infrastructure development. The simplest and fastest way to accomplishing this is adding a Non-Renewable Carbon User Fee to the portion of liquid transportation fuels and natural gas made from non-renewable sources. The fee is designed to disappear as renewable fuels replace non-renewable ones. For instance, once renewable content increases to 85% and mileage increases become fleet-wide, the income from the fee will fall dramatically. In fact, legislation should cancel the fee when income drops below $500 million/year. For examples of price comparisons of current regular gasoline (E10) and high ethanol blends (E15, E30, E85), see the website E85Prices (https://e85prices.com/). For today (March 27, 2019), this chart illustrates the current price benefit of high ethanol blends as a US average. To your request for additional comment questions … Here is a list of ‘No more coal’ taken from my reading notes …. •	BloombergNEF shows coal down to 1.9 percent of U.S. electricity generation by 2050. •	Concerning the financial health of generating units within PJM, the IMM report shows that while nearly every gas-fired and hydro facility fully recovered its avoidable costs from all markets in 2018, only 63% of coal-fired units did so, up from 36% in 2017. •	Over 100 Financial Institutions Now Have Coal Finance Restrictions. •	Georgia Power is facing flat or falling demand, so it wants to remove roughly 1 gigawatt of coal from its fleet in the coming years. The units have become too uneconomical to operate. •	“Ross Harris Group, a family coal company that owns roughly 300,000 acres of land in Kentucky, Virginia, West Virginia and Tennessee, has been a fixture for more than three decades. Coal is still a significant part of its portfolio, but as the industry continues to decline, RH Group has diversified”… into solar. Congratulations on developing bipartisan legislation that can help bridge the gap between current carbon capture technologies and a capture and utilization industry that can truly make a difference solving the immense global emissions problems we currently face. The price signal generated by 45Q tax credits is a start for new investment, but the regulatory risk currently at play via the EPA, which administers the drilling practices regulation, still creates a large disincentive for businesses and investors interested in advancing the technology. Development and deployment of new energy technology can take a generation (25-30 years) to move from initial deployment to material impact on an economy or ecosystem, so time is of the essence. What is clear is that with private capital investment being key to successful deployment of any energy technology, investment risk must be curtailed as much as legitimately and reasonably possible early in the development cycle. As such, for the technology to advance, an exemption for CCS test wells – specifically for Underground Injection Control Class VI geologic storage wells — needs to be written into law. Only then can the ambitions that the USE IT hope to embody be reached in a time frame that matters. I realize I get long winded at times. In a nutshell our Sidel Carbon Capture Utilization System will remove over 90% of the CO2 out of combusted coal exhaust and transform it into money and jobs for under $15 ton. Our sorbent reacts with the CO2 and is transformed into (1) calcium carbonate, and (2) raw stock bio-fuel, and (3) bio-fertilizer. We were concerned at first by the volume of calcium carbonate that our CCU Systems would produce in relation to the volume needed in the world market place. The White Cliffs of Dover are calcium carbonate. Corral Reefs are calcium carbonate. America is already looking to protect it’s shorelines from rising oceans. We have plans to build molds that would turn this calcium carbonate into large “building blocks” that would be crane loaded onto rail cars, to be transported to those areas where these sea walls were most needed. We believe there will be a large market for these sea walls.